I’m pleased to share that a collaboration was announced between the American Board of Internal Medicine (ABIM) and the Accreditation Council for Continuing Medical Education (ACCME). 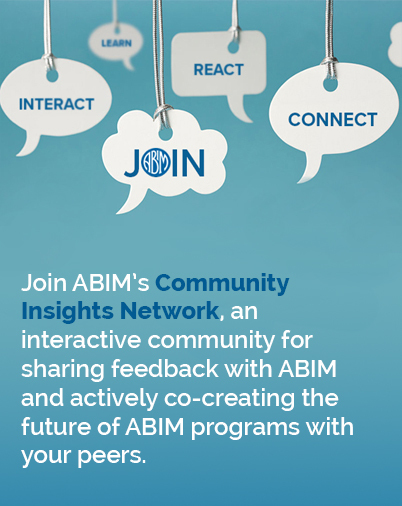 Together, we are partnering to support physicians who are engaged in lifelong learning by enabling them to use more CME activities to meet ABIM Maintenance of Certification (MOC) requirements. This effort expands the options available to physicians to receive MOC credit by enabling CME providers to offer more lifelong learning options with MOC credit for internists and subspecialists. We will begin beta testing the ACCME’s Program and Activity Reporting System (PARS) technology later this month and diplomates will be able to find activities that earn both CME and MOC credit on the ACCME website starting in late September. Read more details in the news release and stay tuned for updates in the fall.